An organizational chart may show hierarchy, but it doesn't represent real business collaboration—how people actually interact inside, outside, and across the organization. Finding ways to improve the connections between people and the information they need to share is critical to improving business. The goal—and the power—of collaboration technology is to help people share as naturally as possible. How do you get there? People don't want to have to think about how to do something, just about what they want to do. Opportunity comes from the combination of technology and people. The collaborative workspace environment gives people the flexibility to be where they need to be to do the best work they can. Cisco uses an architectural approach, integrating mobility, video, and cloud to bring people together anytime, anywhere, on any device. Connect employees, customers, and suppliers to make decisions, resolve customer issues, or address supply-chain challenges. The architecture cost-effectively supports scalability, security, and accessibility. 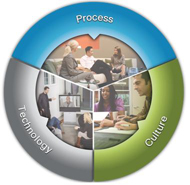 The Cisco collaboration strategy and architecture account for not only the technology, but also for what it means to your processes and culture. In addition to productivity improvements, these solutions can help you reduce travel, real-estate costs, and greenhouse gas emissions by supporting virtual meetings and telecommuting. Ever Wonder What Type of Collaborator You Are? Learn new ways to use collaboration technology to support your business goals.